I’m just so stinkin’ excited to share this post by my mother-in-law! 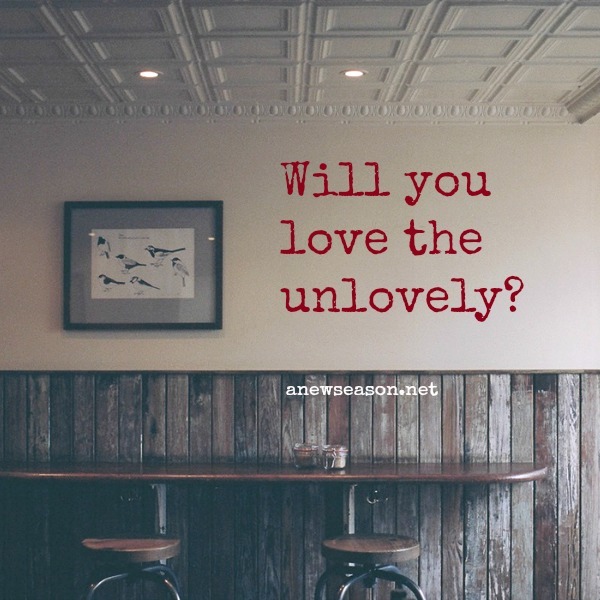 It’s easy to love the lovely, but what about the unlovely? Well that doesn’t seem too hard – food, a warm bed, and some occasional laundry. But God said, “Will you love him, this unlovely one? And point him to me?” Now that journey was not for the squeamish or faint of heart. Jonathan embraced his new family with gusto; he called us dad and mom, was over the moon about his new siblings, and had more energy than any 5-year-old I knew. But he charged through life with intellectual knowledge of Christ, and no real relationship with Him, so we butted heads often. There were tears, disappointments, hurts, and anger, and many prayers! How he drove me to my knees over and over, seeking wisdom and strength for this journey. I didn’t completely understand God’s plan, but I did understand what God wanted me to do, love this boy who had lost his real family, love him when he lied, love him when he disappointed, love him when he hurt me. So love him I did, with every fiber of my being, like a mother would love him! Baby steps forward, big steps back; it seemed at times like this “pretty package” was just too big a challenge! Finally there was the most important victory. Jonathan yielded his life and put his faith and trust in Christ. Oh things didn’t change overnight, but gradually the steps forward got bigger, and the steps backward got smaller as God’s word penetrated his heart. We saw him grow in Christ, be called to preach, and marry, Ami, the love of his life. And my mother’s heart rejoiced. On January 25, 2013, God called him home, ahead of the planned surgery to replace the faulty valve in his heart. People ask me if I would do this again, knowing the struggles, disappointments, and hurts. My honest human answer is maybe not! Here’s the interesting part, however. God didn’t just change Jonathan, He changed me. The love of God is unconditional, full of grace and flowing from His heart “even while we were yet sinners.” (Romans 5:8). He is looking for a surrendered and obedient heart that He can work through. Because that’s His plan, to use His children to love those around us, those who need to know the love of God as more than just a fuzzy idea they once heard somewhere, to love those who need to know the love of God in salvation! Perhaps there is someone that God has placed in your path, someone in your sphere of influence, someone who is not very lovely, but someone who needs God to love them through you. My journey with Jonathan is complete, but maybe your journey is just beginning. Who does God want to love through you? “One more child, He said, for this family of three. One more child, He said, point him to me.” Would I do this again….in a heartbeat! Father, help my heart to be in tune with your heart. I surrender my heart and ask you to love the unlovely through me. Bring those across my path that need to know you and help me share God’s love and the glorious message of the gospel. < Previous And you will find rest for your souls.